The company was founded in 1942, and is specialized in automatic precision turning. It produces on behalf of a third party in automobile, textile, industrial vehicles, arms, bicycles, pneumatic, lighting, taps and fittings fields. Since 2006 Omps owns a new department for manufacturing ribs for sporting arms. 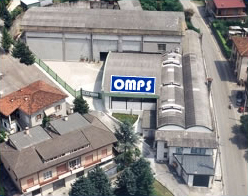 Omps focuses on the manufacturing of precision small parts, using cnc machines as well as with traditional ones. We are particularly experienced in the turning of every type of automatic casehardening, hardening, and tempering steel, some stainless steels, brass and aluminium. Our company has its quality managements system certified conforming to the standards UNI EN ISO 9001:2008 by the Swiss SQS certification company. On request the company can provide testing reports along with the products, as quality warranty. - a machine park for subsidiary machinings, such as milling, drilling, threading, rolling, tumbling, polishing, grinding and assembling which enables us to be full self-sufficient and flexible when scheduling our work. On request we can perform heat and surface treatments.